This week is National Chocolate Week and here at Girls n Gadgets, we’re getting behind it 100%. For those chocoholics out there who can’t make up their mind what flavour chocolate they want, we have the perfect thing for you. 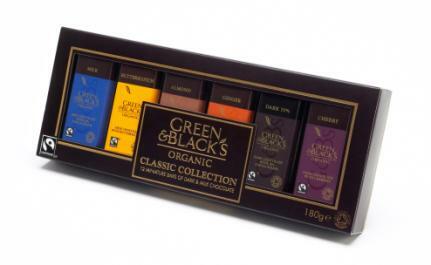 Green & Blacks Classic Collection has a great mixture of flavours. Of course they are completely scrumptious and addictive. They also offer Milk and dark chocolate collections as well as miniatures and gift sets. The collections are great stocking fillers for this Christmas – a must buy in our opinions. They also recently launched 2 new flavours, Chilli and Sea Salt. The Sea Salt flavour has to be my favourite and I just can’t get enough of it. I was intrigued by a chilli flavoured chocolate, however I was pleasantly surprised, it was actually really nice with quiet a fragrant taste. Green & Blacks are certainly a firm favourite here at GnG HQ! Check out their store for more mouth watering products.